If you’re buying or selling a home, you know the home inspection is a critical event in the process. If you’ve contracted with a buyer to sell your home but the home inspection reveals expensive repairs your home requires, your contract may fall through. Similarly, if you’ve contracted to buy a home, the home inspection is an opportunity to get a professional inspector’s unbiased view of exactly what you’re getting into. There are some basic tips that can help you read a home inspection report more effectively. By taking a few minutes to familiarize yourself with these, you can be sure to get the most benefit out of your inspection and be able to speak freely about it with the home inspector, the buyer or the seller. If circumstances permit, your very best means of understanding the home inspection report as a buyer is to join the inspector as he or she performs the inspection. There’s no need to be a pest, but you should feel free to ask questions if, at any point, you don’t understand what the inspector’s looking at or noting down. Given the opportunity, most professional home inspectors will be more than happy to explain things as they go along, and answer any questions you may have. A checklist report is just that: a list of items inspected plus the inspector’s rating, which will usually be limited to good, fair or poor. At the bottom of each section of the checklist there will usually be a spot for the inspector to insert comments about the items listed above. Keep in mind that a rating of “fair” does not necessarily mean the item is in need of repair. Since “good” is the highest rating the inspector has available – even if the item is new – a “fair” rating can just mean the item has standard signs of age or weathering, like a spot of rust on a pipe or some scarring on the vinyl siding. The drawback of a checklist report is that the lack of detail could result in more questions than answers. Don’t be overwhelmed or disappointed by this. Simply make note of your questions and contact the inspector for further detail as needed. A narrative report provides a more detailed rundown of the inspector’s findings, written in an article format in which the inspector basically describes, step-by-step. what was inspected, how it was inspected and what was found. While the additional detail and thoroughness of the narrative report may seem at first glance to be an obvious improvement over the checklist variety, those same features could make the narrative report more overwhelming and more likely to create issues with the inspector’s terminology and descriptions. If you have questions about what a section of the report means or what the inspector meant by a particular phrase, simply contact the inspector and ask. 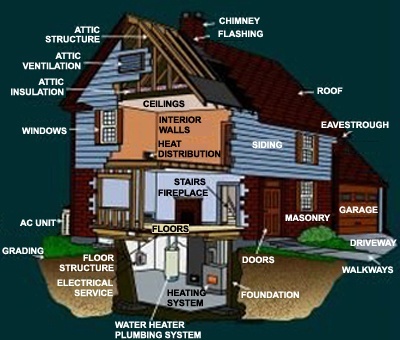 Although your home inspection will cover most aspects of your home – from the foundation to the door frames – certain sections are definitely more important. This may be due to the expense of repair, the ease with which real problems could be overlooked or the fact that it could be dangerous. Electrical system: This must be up to code, in excellent repair, and strong enough to support your family’s usage. If the homeowner doesn’t have four computers, three TVs and a microwave all running at the same time like you usually do, he or she may have never taxed the system like you will. Plumbing: Major plumbing repairs can be costly, and often involve annoying inconvenience or even nasty cleanup work. Don’t forget to get a full rundown of the pipes outside the house as well. Roof and chimney: This is a potentially major repair that could go overlooked early on. Make sure the inspection pays close attention to signs of water damage or moisture around the eaves and the edges of the chimney. Tip: if at all possible, have the inspection performed on a rainy day. Potential health risks: Pay special attention to any mention of mold, mildew or contaminants such as radon gas. All these hazards can be dangerous, even deadly, if ignored. Take the time to read your home inspection report thoroughly and ask for help if you don’t fully understand what something means. Doing so can mean the difference between regretting the biggest purchase of your life or enjoying it. The International Association of Certified Home Inspectors—InterNACHI—is the world's largest nonprofit association of residential and commercial property inspectors, providing education, training, certification, benefits and support for its members. InterNACHI-Certified Professional Inspectors® follow a comprehensive Standards of Practice, abide by a strict Code of Ethics, and take accredited Continuing Education courses each year, including InterNACHI’s online Inspector Examination. Home inspectors, consumers, and real estate professionals can all find the information and support they need to make informed and confident decisions here at InterNACHI.org.